The Hart House Art Committee provides students who are passionate and/or curious about the world of art (outside of lecture halls) an opportunity to meet like-minded individuals and work together to connect the Art Museum and Hart House to Toronto’s vibrant art scene. Since its founding in 1922, the Hart House Art Committee has continuously provided its members with a sense of community and invaluable professional experience. Four distinct sub-committees — Acquisitions, Education and Outreach, Student Projects, and Arbor Room — provide the opportunity to explore various facets of the art world. Learn more about Art Committee events. The Acquisitions sub-committee aims to promote an awareness of local and nation-wide contemporary art practices primarily in Toronto, but also in the major art cities of Montreal, Vancouver and Halifax, bridging art historical, curatorial, Collections Management and museological skills in a practical and hands-on environment. The Acquisitions sub-committee is responsible for reviewing and developing acquisition of new works for the Hart House Collection under the guidance of Art Museum staff. Members participate in gallery and studio visits over the course of the year to familiarize themselves with the practice of contemporary artists. Members of the Acquisitions sub-committee will learn about contemporary art in a gallery setting: examining the monetary and cultural value of artwork, how it could contribute to the Hart House Collection, and its maintenance and care. Learn more about recent Hart House Collection acquisitions. The Arbor Room sub-committee creates calls for submissions, selects works from the submissions, and installs the works in the Arbor Room, facilitating the display of the works by student artists in a professional exhibition. The members of the sub-committee gain experience in curating, installing, and promoting a public exhibition, building skills in organization, teamwork, leadership, and communication. The Education and Outreach sub-committee develops events and programs for the Hart House Art Committee, connecting artists, art students, and the wider visual art community in Toronto. The sub-committee facilitates projects and workshops associated with the Art Museum’s programs, allowing students to develop professional skills in marketing and promotions, program development, communication, and teamwork. Working closely with Art Museum staff, the Education and Outreach sub-committee develops workshops (on topics ranging from writing and publishing in art, installation, portfolio making, etc. ), open forum discussions, tours, and other programs providing opportunities for hands-on professional education. The Student Projects sub-committee is the site-specific curatorial project of the Hart House Art Committee, fostering the means and space for one University of Toronto student to create an installation in the House. The sub-committee develops a call for submissions, selects of installation piece, and implementing the final project, working closely with Art Museum staff. Over the course of the project, skills in marketing, art contracts, institutional logistics, installation practices, and leadership are developed in this unique curatorial experience. 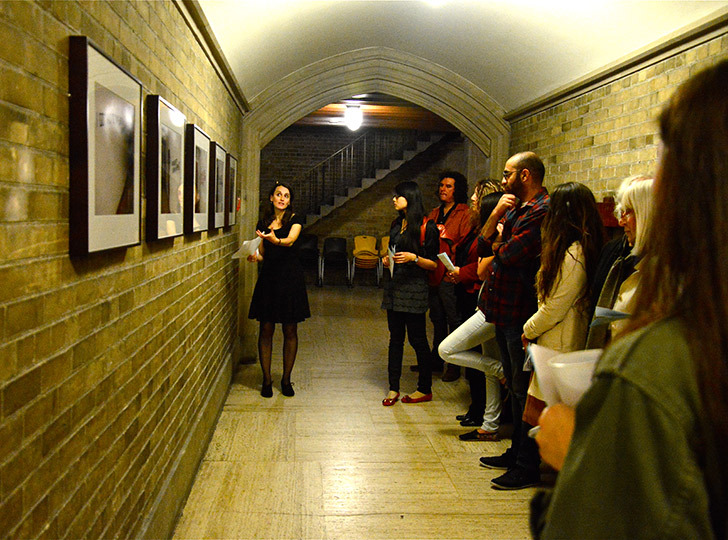 Work-Study positions and Hart House Art Committee positions at the Art Museum are listed within the University of Toronto’s Co-Curricular Record (CCR), a university-wide database for students seeking opportunities outside the classroom. The CCR promotes activities for students that build connections between academic learning and workplace experience. When participating in CCR-approved activities at the Art Museum, students will be able to print off an official validated record of their involvement. This official record will allow students to contextualize their participation at the Art Museum for potential employers, graduate and/or professional programs, and awards or scholarships. For more information on the Co-Curricular Record at the University of Toronto, please visit their website. Professionally trained student docents lead monthly tours of the Hart House Permanent Collection as well as during city wide events including Ontario Culture Days. Tours use questioning approaches including Visual Thinking Strategies to develop visual literacy. The call for applications is posted annually in December on our Facebook page for the following year. For more information, please contact The Art Museum.